Memorial Day Sale at Stella and Dot! This is a great time to shop at Stella & Dot because this Memorial Day weekend they are offering up to 50% off sale items and free shipping on orders over $100+, until 5/27. Get discounted prices on items like the Stella & Dot Leona Pendant Necklace , the Stella & Dot La Coco Clutch – Black or these Stella & Dot Cleo Fringe Statement Earrings. Check out Stella & Dot’s Memorial Day Sale today! Become a Stylist for Stella and Dot! Join the Stella and Dot Stylist Team! Earn Dot Dollars in June with Stella and Dot! 20% Off Everything at Tea Collection! 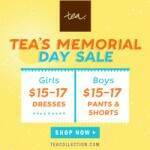 Tea Collection Memorial day Sale! 40% Off Sale at Mabel’s Labels! 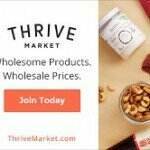 Is a Thrive Marketplace Membership for You?